It’s no secret that germs and viruses spike in the winter months, including the flu. That's why it's important to refresh our minds each year on all the various ways to prevent the spread of germs in the office. As always, our goal is to keep you focused, happy and healthy during your long and busy workday. As mentioned, this is the common method you hear of when trying to avoid exposing yourself to bacteria, and for obvious reasons. Our hands are always touching a surface and are exposed to countless amounts of germs that are easily spread from person to person. Think about the object your touching right now. Now think about how many people have touched or been around it recently. Scary, right? Touching our eyes, mouth or nose can invite these harmful yet invisible agents into our body and make us sick. Scrubbing your hands with soap and warn water for at least 20 seconds is the best way to clean your hands, especially after using the bathroom, touching the garbage, coughing and sneezing, and before preparing or eating food. Really, there is no bad time to scrub your hands. No sink nearby? No problem! Hand sanitizer is the best alternative to soap and water as it can kill cold and flu germs. Not every type of sanitizer will do the job. According to Live Science, you want to use an alcohol-based sanitizer that is at least 60 percent pure alcohol, as this is the most effective in combating bacteria. Often times offices and public areas have automatic dispensers for a quick refreshment, but you may also want to keep a bottle of hand sanitizer on your desk for extra protection. If you're on the go, the pocket-sized versions are great to keep in your purse or car. You can never have too many bottles of hand sanitizer! Before we dive in we should first cover the meaning of antimicrobial. According to the National Pesticide Information Center, antimicrobial agents "kill or slow the spread of microorganisms.” These microbes include bacteria, viruses and fungi. So, how does it work? Antimicrobial products are created by adding the growth-inhibiting chemical agent during manufacturing. 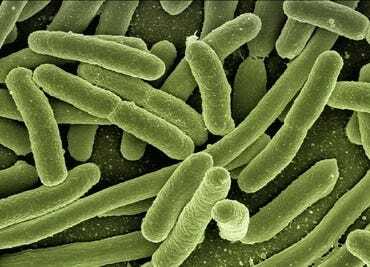 When the unwanted bacteria and viruses come in contact with the antimicrobial product, the cell wall of the living microbe is broken, destroying its function and reproduction. There is a large range of consumer goods that are considered to be antimicrobial, including towels and toys, which are well-suited for homes. However, it's also important to guard compact and populated areas such as classrooms and offices. 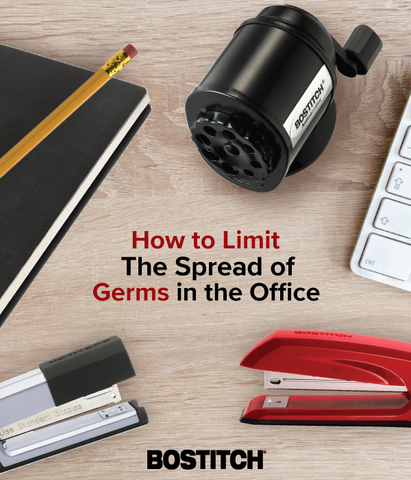 An effective solution to protect items in these environments is to add antimicrobial office products, such as staplers and pencil sharpeners. These tend to be among the objects that are consistently used and shared among individuals. Bostitch Office has many antimicrobial supplies varying in different types of staplers and pencil sharpeners; be sure to browse them here! Your desk may look clean, but don't let its clean aesthetic fool you. Deb Group reported that Dr. Charles Gerba of Arizona State University found that "the average office toilet seat had 49 germs per square inch." Though, that's not the chilling part. "Desktops had almost 21,000 germs per square inch, and phones had more than 25,000 germs per square inch." Wipe down your keyboard, telephone and desktop with bacteria-killing cleaning products daily to stay ahead of germs. Common areas are especially important to sanitize as they cater to an array of people. Make sure kitchen sinks, appliances and door handles don't get left out of the cleaning check-list. Feeling under the weather? Stay home. Even if you think that your symptoms are nothing to worry about, you could easily expose your coworkers to the germs you are carrying by going into work. We know you're just trying to do a good thing and get your work done, but it's better to be safe than sorry. And if you hear sniffling and sneezing from across the room, simply keep your distance and do the techniques above. While there's nothing you can do to completely guarantee you don't get sick, you can always try your best. As the cold, bitter months are creeping closer and people are more likely to be indoors, it’s best to take all precautions when it comes to maintaining your health! Wash your hands, desks, and countertops, while additionally protecting your office supplies in a more effortless manner with antimicrobial products! Y'all have a typo in the first paragraph. I believe it should read "all the various ways to prevent the spread of germs" instead of "wats".